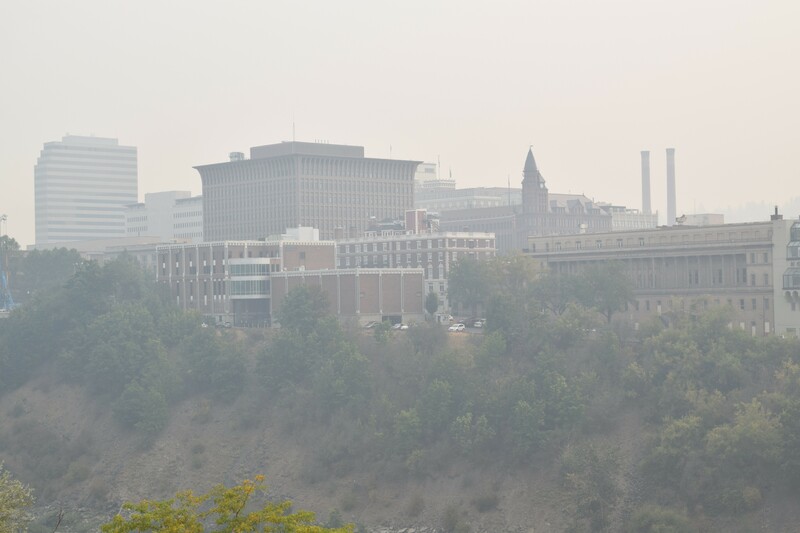 Smoke fills the Spokane air in this shot of downtown taken on Wednesday, Sept. 6. The entire region is so clouded with smoke, the light from the sun is struggling to break through. The air is so unhealthy to breathe that schools have canceled outdoor activities and people avoid leaving their houses. Is this becoming more common for Inland Northwest summers? The answer is yes, says John Abatzoglou, a University of Idaho climate scientist. Ironically, work to put fires out has actually contributed to increased wildfire activity in the region. Coupled with human-caused climate change, more wildfire activity will continue in the future, he says. Yet he's careful to note that certain factors contributing to the wildfire smoke in the region this year, and in 2015, are not necessarily linked to human activity. And just because it seems worse this year, that doesn't mean it will be like this every year from now on. "I don't think this is the new normal," Abatzoglou says. "We have seen more years like this recently, and we will see more in the future. But I don't think it's going to happen year after year." Abatzoglou studies the impact humans have had on the increased western United States wildfires in recent decades. Last fall, he and Columbia University bioclimatologist Park Williams published a paper on the topic. They found that human-caused increases in temperature and fire suppression in forests have contributed to increased wildfire activity in the western U.S. And those factors will continue to impact wildfire activity in the coming decades, the paper found. When humans settled in the region, we started suppressing fires, Abatzoglou says. Eventually, that meant there was more and more fuel in the forests accumulating, waiting to burn. Simultaneously, global temperatures increased by a couple of degrees over the past 150 years. Together, they have created conditions for more forest fires — until all the fuel runs out. "One silver lining is that as fires do burn in our forests, they are removing fuel. And oftentimes that will make a landscape less fire-prone," he says. That day, however, is decades away. In the meantime, Abatzoglou says we can expect more summers like this and 2015, when there was similarly poor air quality, Spokane Regional Clean Air Agency data show. Yet while he says there is a "trend" toward more wildfire activity and smoke in the region, it's still too early to say that this will be an annual problem. Abatzoglou notes that in both 2015 and 2017, weather conditions have uniquely been dry. That's not necessarily linked to climate change, he says. National Weather Service Meteorologist Bryce Williams agrees. In 2015, there was low snowfall the previous winter. Williams says it was "one of the driest winters we have had in a long time," causing the fire season to start early across the region. This year, we had a wet winter and spring. But this summer, Spokane International Airport's weather monitoring station is on the verge of breaking a 100-year-old record for the most rainless days. If there is no rain by Monday, Sept. 11, the station will have broken the previous record of 73 consecutive rainless days. Williams points out, however, that in 1917, conditions were much drier across the region. This summer, other recording stations near Spokane have recorded rainfall. He says the streak with no rainfall at the airport gives a "false impression" that conditions are drier in 2017 than 1917. "We can't really draw any conclusions from one or two summers," Williams says. "This isn't unprecedented." It's entirely possible that next year will be a quiet fire season, with less smoke lingering in the air, he says. "It doesn't mean we're moving toward this every year," Williams says.